You'll know you've arrived the second you get inside Corolla. The dashboard has been redesigned to enhance Corolla's upscale feel, featuring flowing lines, premium materials and available contrast stitching. Beautiful piano-black accents surround the large touch-screen, bringing the right amount of tech and beauty to this inspiring space. Color-matched accents on the dash panel, steering wheel and shift boot elevate the Corolla 50th Anniversary Special Edition's style. When you're in Reverse, the standard integrated backup camera helps you see more of what's behind you by giving you a view of what the camera detects from the rear. This feature is especially useful when you're parking in a tight spot or backing up. With Corolla's steering wheel controls, your music and more are right at your fingertips, so you can stay in total command. And with Corolla's advanced voice recognition, you can access the info you need just by talking. It's easy to use: Just press the button, give one of the supported commands, and you're done. 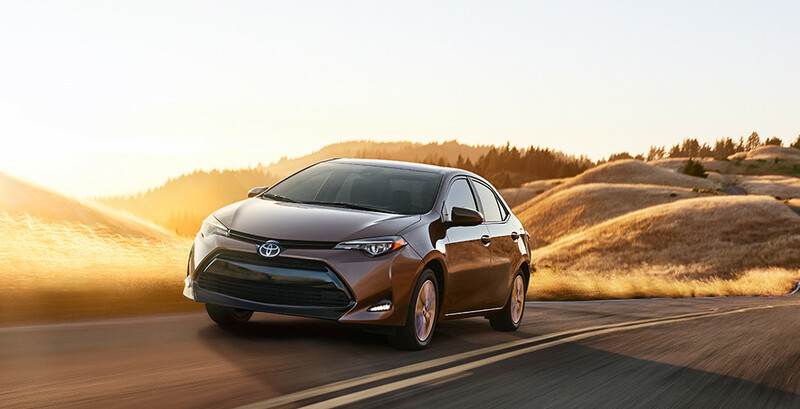 When enabled, the available ECO Mode button on Corolla LE Eco eases the gas pedal output and adjusts the air conditioning for enhanced fuel efficiency. Push a button, and you're helping save gas. Now you can go the distance for a long, long time.